The fishmonger was sizing me up as I ogled indecisively behind the glass counter. He finally declares with conviction that the fresh catfish is what I really want, this time. And that I should take it home, spice it up and put it under a broiler. Already! And that if I wasn’t convinced, he’ll pay me back for it. Wow! I was taken aback. The look in his eyes and the tone of his voice was enough to bring a virtual flavor into my palate. I just had to take his word for it. Now, the verdict. In the next few days, I will be going back. Back for more of that insanely good catfish, that is. I think I’m hooked (no pun intended)! Do this at least an hour ahead. Place filet on a small non-stick baking sheet and brush with a small coat of oil on both sides. In a small bowl, mix equal parts of garlic powder, cajun powder and cayenne. Sprinkle filet on both sides with powder mixture and parsley flakes. Give it a good squirt of lemon juice as well, and set aside to marinate in the fridge for about an hour or so. Preheat broiler. Meanwhile, mince the garlic. In a medium-low heated non-stick pan, sweat garlic with 2 tbs. oil for a few minutes to extract flavor. Take the rice out of the fridge and break the lumps apart with your bare hands (or a spatula). Quickly transfer to the pan and raise the heat to medium-high. Press the rice with the spatula to evenly distribute accross the pan and let sit for a about a minute or until the pan has fully heated to tmeperature. At some point while cooking your rice (5-10 minutes), the broiler should be fully heated. Take the filet out of the fridge and pop in the broiler for about 12 minutes or so. Now back to the rice. Sprinkle with a little salt and pepper and start stirring vigorously to evenly distribute the garlic all over the rice. The garlic should now appear nice and golden. Keep stirring for about 10 minutes. Now, dice the celery sticks and put back in the fridge until dish is ready to serve. Transer rice to a serving plate, top with filet and squeeze more lemon juice. Garnish with chilled diced celery. 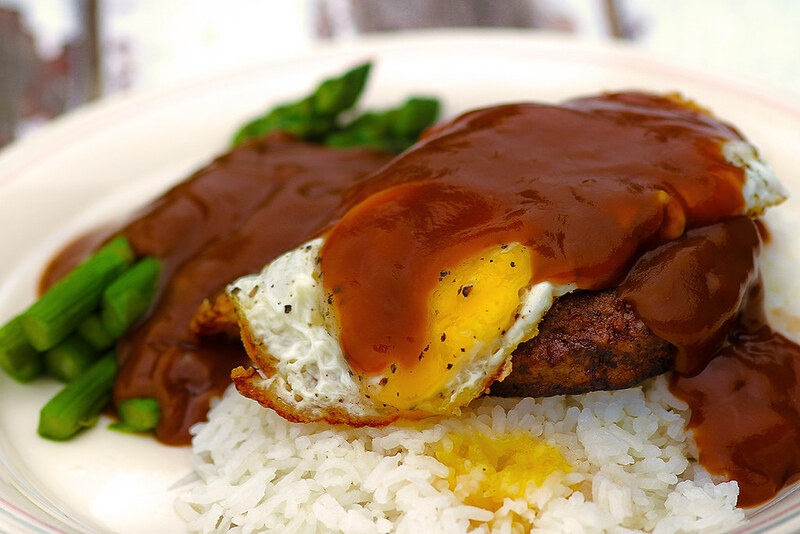 Serve with your favorite sauce (i.e. tartar or hot sauce). 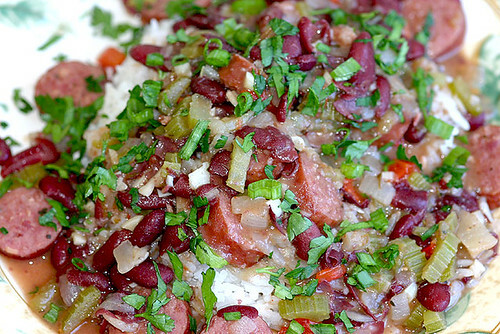 Never heard of red beans and rice until I went to visit Louisiana in the mid 90’s. It’s amazing… the one thing that stuck with me the most during my visit was the food. I remembered the food! It left an indelible mark on my palate. Especially this dish. It’s peasant eats, so simple and humble yet full of soul and depth of character. Every since my visit, I’ve always made it a point to prepare red beans and rice once a month. It’s comfort food at its finest! Bon apetit! Directions: Cook rice. In a pot or dutch oven, saute thinly sliced sausages, minced garlic and diced trinity in olive oil. Add beans, stock and seasonings. Mash as much beans as you can while boiling in the stock. Stir often until reduced and thickened, more or less 30 minutes. Add chopped parsley and scallions at the last minute. 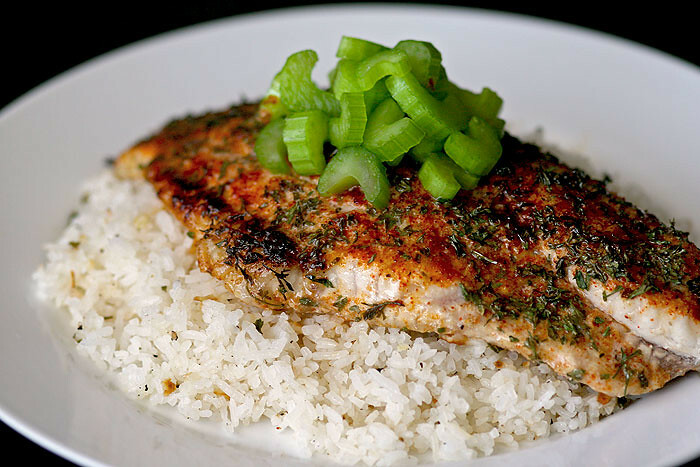 Serve with rice and kick it up a notch with a little hot sauce.